With the Rampur molestation still in the news, yet another molestation video, this time from Bihar, has highlighted the growing ignominy being faced by women in remote parts of the nation. In the video, a school girl in her uniform along with her friend can be seen being harassed by a group of men in Bihar's Muzzafarpur district. 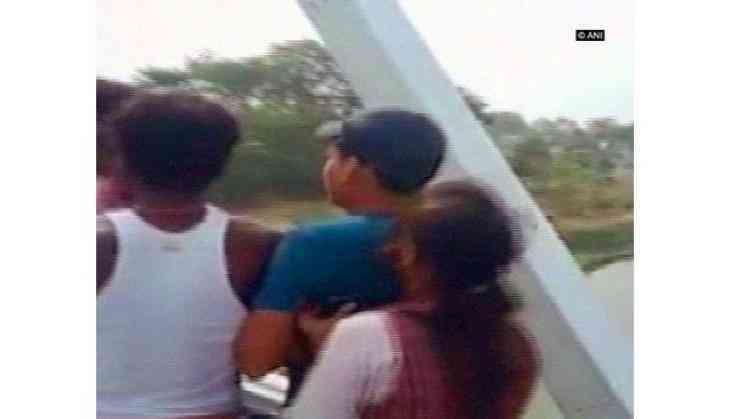 The duo was sitting on the Budhi Gandak Railway Bridge, when they were accosted by the group, who began molesting the girl in front of her friend. When he objected to his friend being harassed, the men started brutally thrashing him, while the girl is seen in the clip trying to hide behind him and begging to be let go. Following the uproar and the outrage cause by the shocking video, Senior Superintendent of Police (SSP) Vivek Kumar told ANI that he has ordered a probe into the matter and assured that strict action will be taken. "The female student's statement will be recorded and strict action will be taken against the culprits. The police are contacting the school management and will get hold of the culprits soon," he added. It has been over five days since this video has been making rounds on the internet, and the police has not been able to track down the perpetrators. However, in the Rampur case, action was taken more swiftly than anticipated as the police managed to round up at least 10 out of the 15 boys seen in molestation video. The social media was set on fire, after a video two women being molested by a group of men in broad daylight in Uttar Pradesh's Rampur surfaced. Around 12 to 14 boys can be seen in the video, molesting the women, even while they pleaded to let them go. Proving the sheer fearlessness of the perpetrators, the boys filmed the entire development and posted it on social media. Besides manhandling and molesting the girls, the boys were laughing and making jokes the whole time, while the distraught girls kept on begging to be spared.